I've been sick all week with what I can only guess is the flu and am still not feeling 100%, but today is the first day I'm wearing something other than pajamas and although I am going to keep resting today and through the weekend, I wanted to spend some time here in my studio and here on my blog... with you (good thing you can't catch germs over the internet!). Last May I conducted my first ever reader survey for my blog. I am not sure if I really learned anything useful from that survey. Or maybe that's not true. I think it confirmed some things that I had already been thinking. But it also clarified some facts that made things more complicated. And I was never really sure what to do with the conclusions I'd drawn from the survey. Although I consider my blog to be part of my art business, my blog readers are not, generally, my art customers. Despite the fact that I'd been writing my blog for almost 7 years (at that time) only about 30% of my readers had been reading my blog for 1 or more years and only about 17% had been reading it for more than 2 years. The series I was hoping to phase out (the Sketchbook Conversations interviews -- because those posts were so much work) ended up being the second most popular type of post. Basically, I was left asking myself the question "Now what?" I've asked myself that question a lot over the last year or so and I think I'm still asking myself that question. I've had lots of ideas of how to answer it. Last fall after taking the business class with Arianne Foulks of Aeolidia, I even considered the possibilities of retiring this blog and starting a new one or splitting my blog into two. What a tiring thought! I didn't end up doing those things. Instead, I spiffed up my design (do you like the new look? Is it inconvenient not to see the whole post on the main blog page? I'm still not sure what I think) and I pared down my posts to one a week (I'd still like to reincorporate Joy List Monday in a fun new way, but I haven't had the time to devote to it yet). My monthly page views are down, but I only just realized that of course they would be with there being 1/3 fewer posts each week and therefore each month, too (the views are not down by 1/3, though, which I think is a good sign). 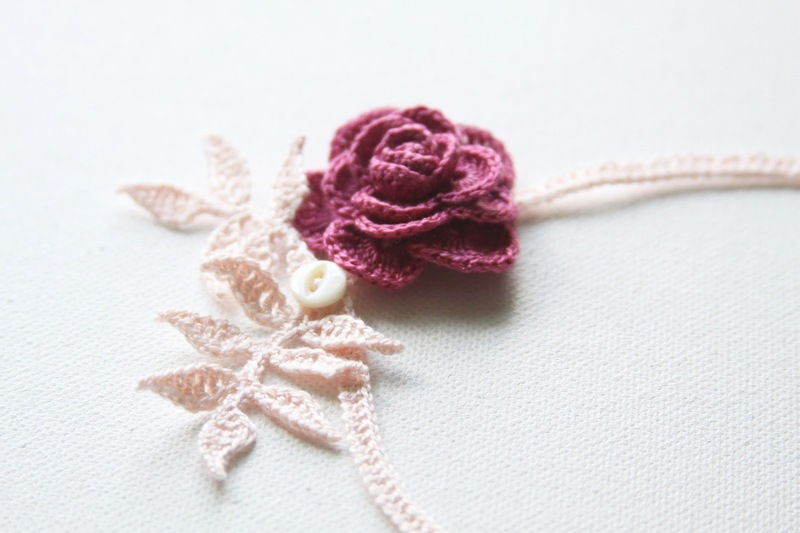 Even though my focus is not crochet (or even crafting), my most popular post continues to be the one where I share the pattern for my crocheted roses. Are blogs even still relevant? (Google "Is blogging dead?" People have lots to say about it). Some of my favorite blogs no longer exist. I also spend a lot less time reading blogs than I did in the past... and I know it's not just me. There are SO many opinions out there about what artists/business people/bloggers SHOULD be doing. As someone who's been learning about business as I go, I do look to other people (experts) for advice and suggestions. How a blog should look. What a blog should say. What to include. What to leave out. BUT a lot of that advice conflicts with how I feel about my blog and my business. For example, some people would say I should delete that crochet post (and other older posts) because it doesn't fit with my current focus. At the beginning of the year I wrote some general business goals. One of them was "Make meaningful connections". I think that through my blog I do make meaningful connections. And I want to continue to make meaningful connections here. I want to encourage and inspire. Meaningful connections. Encouragement and inspiration. They are important parts of my business, but they also can't be measured by numbers following a dollar sign. Again, I ask myself "Now what?" In some ways that answer is easy. I'm going to continue with the intention of making meaningful connections. I'm going to continue with the intention of encouraging and inspiring. I'm going to follow the path that is right for me. Maybe I'll make mistakes and do things wrong, BUT they will be my mistakes. I recently wrote in my journal, "I can't be running around doing someone else's shoulds". I think a lot of us do, though. Much of my life I followed other people's shoulds for my life. Everyone does to some degree or another. Eventually, though, we need to find our own way. We need to follow our own MUSTS, not anyone's (even our own) SHOULDS. It certainly isn't easy and I think it will always be a work in progress. Ok, enough from me. I would love to know what YOU think. What you'd like to see here on my blog. I might do a more formal survey in the next few weeks, but until then, share your thoughts in the comments below or email me and let me know what you think. Thanks for being here and thank you for all of your inspiration and encouragement. They really mean a lot! Thank you for your honest feedback, Simone! I completely understand how disconcerting (and frustrating) it can be when a favorite blog changes their format. I can think of one that I used to like to read that's gotten less easy to access with a new format. It's also interesting to hear that you miss my less focused posts. I'm hoping that I can incorporate more of that into my blog with my Gentle Nudge posts. I just have to figure out how to balance it all! (Always the trick, I guess!). I really appreciate you being here and thanks for taking the extra effort to keep reading! Thank you! And yes, it is on the way, hooray!! Hello Anne! I've been reading your blog for a little over a year and would like to share that my favorite thing so far is "the gentle nudge towards creativity" pieces you have recently done. This idea inspires me so much b/c it gives me permission to take time to be creative and emphasizes the importance of doing so for balance and well-being. I would love to see more of these posts since I feel they help guide readers along in that direction. Hi, Nicole. I appreciate you sharing your thoughts with me. I'm really enjoying those posts, too, and am planning on making them a monthly feature. They help hold me accountable, too! No worries, Simone. I was a little confused by that part of your comment, but knowing that the format of the blog page was confusing to you is still helpful to know! Holy moly is that an interesting criticism. I can't really believe that anyone visiting my blog would not know what it is that I sell and what my business is about. I'm still trying to wrap my head around that! It makes it clear to me that my blog as a marketing tool is not at all working! 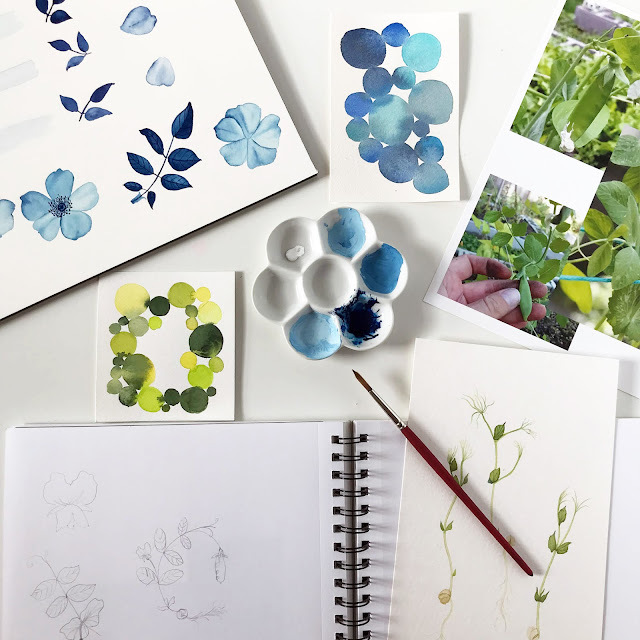 This blog isn't really about selling art, but it is here to give an inside view into my studio and the life behind the artist (as well as being inspiring and encouraging to other creative people). I try not to include too much in my posts about this or that being for sale and I guess by doing so I've tipped too far in that direction. I do put links when things are for sale and I know I've mentioned about fabric being for sale, specifically and there IS a link to my shop at the top of my blog, but all of that might be a bit too subtle? I will be pondering all those questions and trying to figure out how to give a more complete picture of what I do as part of this blog. As one solution I've added a little informational signature to the bottom of my posts that will, I hope, help to answer some of those questions! Thank you, thank you, thank you, Cathy for pointing this out to me! I enjoy reading your blog. I am a fairly new follower but have been a blogger for many years...sometimes diligent, sometimes sporadic. I think the question you are asking is something many of us go through...newbies or old hands. And there are always many answers. How to do it, what's important, goals, should I advertise, should I ask for donations, etc etc. For myself, I enjoy reading real posts from real people. Snippets into their lives. Snapshots. Sharing words and ideas and thoughts. It's what I do on my own blog. And I have come to terms a long time ago with the fact that I am not doing this for money or popularity or fame. I do it because it enhances my day. It makes me want to go out and snap new photos on the days that I might be tempted to just stay in bed. It allows me to make connections with like minded people. It gives me a push and it gives me a comfortable place to share what I want. Thank you, Arlene, for sharing your thoughts about this blogging thing (and I am glad you enjoy reading my blog!). I am completely with you as to enjoying reading about snippets of people's lives. That used to be the norm with blogging, but it's fallen out of fashion a bit. Or so it seems. I'm also with you that I'm not blogging for money or popularity or fame. Of course, I'd like my blog to be a nice complement to my art business. For people to get to know a bit more of where the art comes from and who I am. AND I want to inspire others. To follow their dreams. To be creative. To find the joy in every day. I think that's the most important part for me. "Do it for you" is the best advice. As I become more and more disillusioned with IG (so much clutter there, with "sponsored" posts and the stupid way they order our feeds), I long for the old days of blogging. And I do not post as often as I used to, nor am I sure which way to go. Our voices seems to echo a bit, in the quietude out there. Thank you, Karen, for adding your thoughts here. I LOVE the idea of advocating for a revival of blogging. I'm all in! Hi Anne! I am just getting around to catching up after the 30 in 30. I really am intrigued with this post. Mainly because I want to know the same things you want to know for my own art business and art blog. Reading these comments really is enlightening in many ways. It makes me look at my own site with a different lens. It seems a lot of bloggers are artists, and I wonder why. Or perhaps I think that because those are the ones I tend to follow myself. As I look through my analytics and see my most popular posts, it is disheartening to me a bit as well. My most popular page by far is a Halloween post, and not at all what I'm in business for. I enjoy writing for the journaling aspect of it and my blog reflects that with it being about my life. However, I won't lie, making myself more appealing to Google is more of a push to be consistent. Karen mentioned being tired of the way IG is heading and I agree and think that all of the social media is that way. I too, long for simpler days of discovering blogs or keeping up with the lives of my online friends (such as you!). Many of my favorite blogs have been abandoned as well. It's so hard to know what we should be doing when there is so much advice claiming to be THE THING that you NEED to do to be successful. I think a lot of bloggers are artists (and other creatives... sewists, crafters, etc) because blogging itself is a creative endeavor. 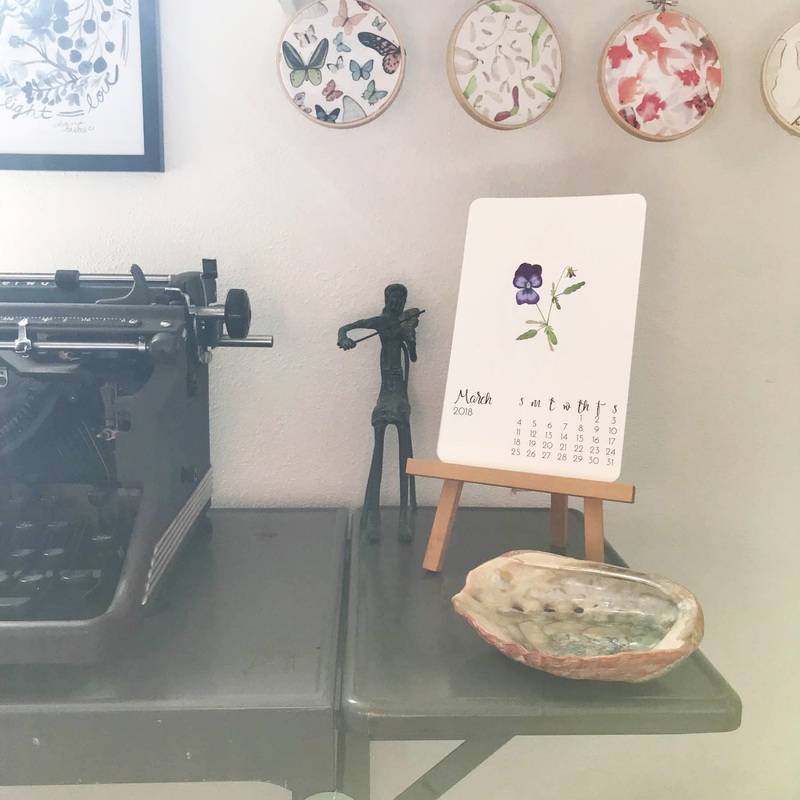 Maybe we need to ask ourselves why we started our blogs in the first place and compare that to what we want from our blogs now, perhaps realigning with our true passion. Sometimes I think I should just throw all the analytics out the window and blog what I want to blog without worrying about anything else. I'm definitely on board with the annoyance with IG. It's the only social media account that I use on a regular basis (I keep thinking I need to revive my Pinterest account, but it seems like a lot of work!) and I really used to love it. Now, it's not as fun. I deleted FB because I just can't stand it and I really hope I don't have to end up ditching IG as well. I've seen some people leaving to go to Vero, but I don't really know much about it and hate to jump on yet another platform that ends up fading into obscurity. Sorry for the ramble, but I think these are things that need to be talked about and not from the "This is the way you do it" approach. Thanks for sharing your thoughts! I hope we can continue the conversation.